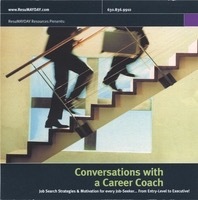 We’re happy to report there are a lot of low or no-cost resources for job seekers in the Chicagoland area. 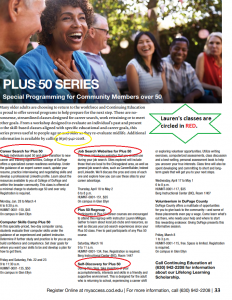 College of DuPage contributes to this bounty with their Plus 50 series of classes taught by local experts, including Lauren Milligan, of ResuMAYDAY. These classes are part of the Continuing Education curriculum, which means you don’t have to pay for credit hours. It’s all very simple and budget-friendly. The ‘Career Readiness’ class is a 5-week series that includes resume writing, LinkedIn, interviewing skills, ageism in the workplace, and negotiating skills. The ‘Self-Discovery’ class is a 3-week series full of self-assessments, writing exercises, group exercises, all geared towards helping you discover your most fulfilling path in your career or volunteer hours. The ‘Job Search Websites’ class provides a whole catalog of great websites to utilize in your search, and also steers you away from the time-wasters. Later in the year, the ‘Networking’ class and ‘Negotiation Skills for Women’ class will be added to the roster. Here’s a screenshot of the catalog and schedule. For a better view, head over to page 33 of the College of DuPage Continuing Education catalog, here. Big changes for the tax year 2018! Job seekers, the federal government has ended job-search related expense deductions. You’ll definitely want to talk to your tax accountant if you spent money looking for a job in 2018. Perhaps she’ll find some kind of loophole in your favor, but most people will experience a three-prong loss: no income; job search expenses; no deduction relief. Ouch. Guest Bloggers and Web Marketers: By proposing to write a guest blog post for ResuMAYDAY or soliciting your web services,you have agreed to donate $35 to Bridge Communities at THIS LINK. Your donation won’t result in a blog post or a sale, but it will provide a homeless child with one night of a safe and warm place to sleep. Likewise, the moment I get this: “Hey Lauren, I sent you an email last week about our web development services but never heard back from you…” you also have obligated yourself to donate $50 to Bridge Communities (same LINK.) because these emails are especially annoying. Seriously, do these emails EVER result in a sale? Leave me alone and do some good in the world. Do YOU want to learn more about the good that Bridge Communities does in the world? (It’s a lot.) Visit www.BridgeCommunities.org.